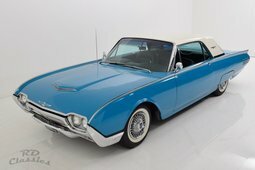 Ford Thunderbird. © Ford Motor Co.
2002-2005 Ford Thunderbird was a modern interpretation of the original. © Ford Motor Co.
Ford introduced the Thunderbird roadster as a direct competitor to Chevrolet Corvette. 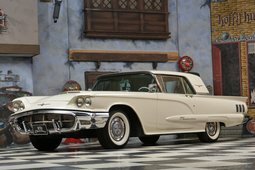 While the 1955-1957 Thunderbird resembles Chevrolet’s sports car in many ways, it offered higher level of comfort to its passengers. This overlap of sportiness and creature comforts meant that Ford has discovered a new niche, which they named the “personal car”. 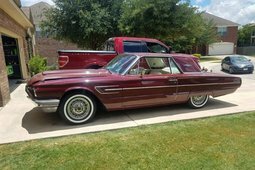 There are two versions of the Thunderbird’s origin story and you are welcome to make your own judgement. Ford states that the idea was conceived in 1951 when their executives Louise D. Crusoe and George Walker were visiting Paris and admiring European sports cars, and Crusoe suggested that Ford should make something like that. Walker, responsible for the development of new models, said that there was something very similar in the works. Actually, there was no sports model developed at that moment, but Walker shared the idea with the headquarters in Dearborn, US and by the time Walker and Crusoe returned, the car was already being developed. 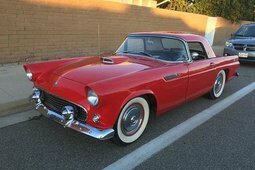 Another version of this story is not as romantic, it suggests that the development of Thunderbird began in early 1953, immediately after the Corvette prototype was presented. Ford developed the car so rapidly, that in February of 1954 it was officially presented to the public in the Detroit Auto Salon. The secret to such swift development was using off-the-shelf components of models from Ford and its subsidiaries. The frame itself was a shortened version of the components used in other Fords of the era, it was adapted to match the exact length of the wheelbase of the Corvette, 2.59 m. Although Ford claimed the size of the car was determined by looking at European counterparts, namely Jaguar XK 140. 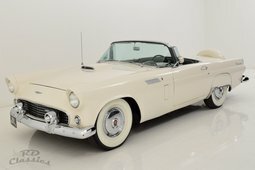 When the car reached production in 1955, Thunderbird’s 4.8-liter V8 was sourced from Ford’s Mercury marque, putting out reasonable 198 hp. 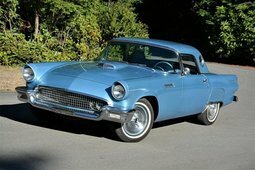 Thunderbird shared multiple exterior and interior components, including headlights and taillights with other Fords at the time. Even though Ford and Chevrolet are essentially Coca-Cola and Pepsi of automotive world, their sporty products differed quite significantly. Firstly, Corvette utilized a lightweight fiberglass body, which lacked the refinement that Ford’s fully-steel counterpart was offering. Roofless Corvette did not match the structural rigidity that Thunderbird had, thus there were far fewer squeaks when driving the latter. In addition to that, the first generation Corvette was offered with inline 6 engines, while the Thunderbird only came with V8. 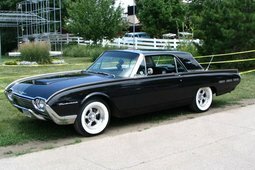 Thunderbird was also less focused on going fast through the twistiest or on a track, so it was not exactly a sports car. Instead, Ford discovered it would best suit a niche of its own, which they dubbed a “personal car” class. 1956 model year Thunderbird featured several changes, among which, a new higher performance engine was offered. Ford Y-block 5.1-liter V8 had 4 Holley carburetors and produced 225 hp. The standard engine was still on offer, with its power bumped up to 202 hp. Thunderbirds design was revised as well, most notably the car had a relocated ‘Continental Style’ spare wheel, which was mounted in the back of the trunk. Other minor tweaks included bumper-exiting exhausts and optional round rear side windows to aid the visibility. 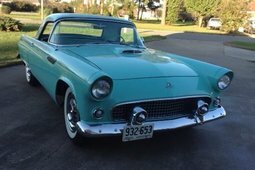 1956 was also the year when Thunderbird was converted to modern 12-volt system. 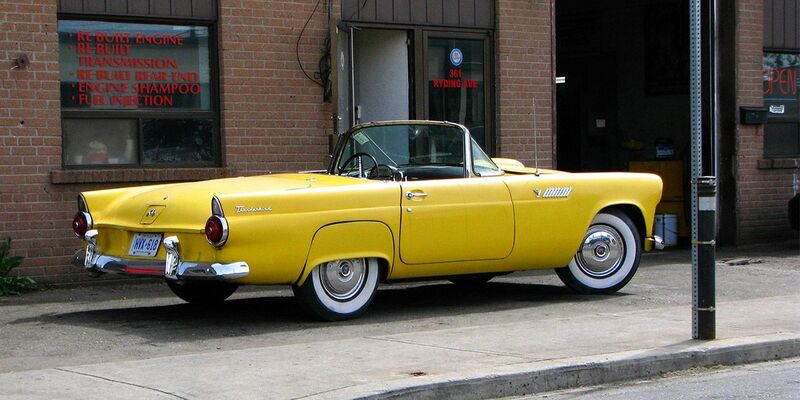 For the last year of the T-bird, 1957, some more changes were in line. The front grille got bigger to aid cooling and the trunk has been elongated with more prominent jet-inspired tailfins. The spare wheel was moved back into the trunk, making the lines cleaner and trunk access easier. Normally, this being an American sports car, revised model was even more powerful, with improved engines across the range. A new top of the line supercharged version of the 5.1-liter V8 was added, capable of 300 bhp. All Thunderbirds of this iteration had soft padded dashboards, which were considered a safety feature back then, but are a laughable innovation today. 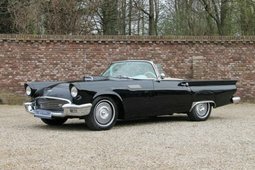 Ford’s first attempt at a “personal car” was replaced by a new four-seater in 1958. Just over 53 000 of first-gen Thunderbirds were produced over the three years. The nameplate was used for eleven generations of the car in total, although it was less sport oriented in later versions. The eleventh generation of T-bird came out in 2002 and was clearly a homage to the first cars, featuring retro styling and mechanics derived from Lincoln LS. 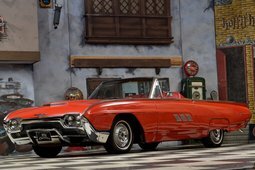 First generation Thunderbirds in good condition are sold for 30,000 € and upwards. Unsurprisingly, they are easier to find in US, but plenty are available in Europe as well. 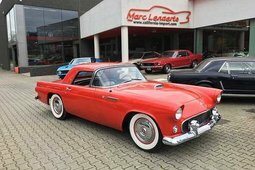 The upkeep of these roadsters should not cause too much of a headache, as the components are shared with other Fords, Lincolns and Mercuries of the era, making the parts easier to come by.